According To Npower, they are still expecting deployment schedules from the following states. 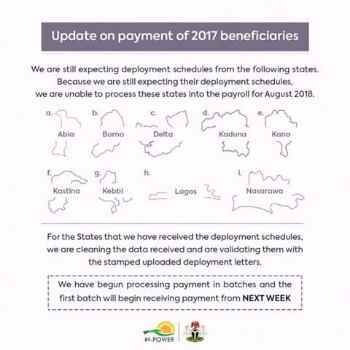 Because they are still expecting their deployment schedules, Npower are unable to process these states into the payroll for August 2018. For the States that they have received the deployment schedules, they are cleaning the data received and are validating them with the stamped uploaded deployment letters. The image below contains the status of payment for the 2017 beneficiaries. N-power are yet to receive the deployment schedule for 9 states so the beneficiaries in those states cannot be processed. Others will begin to receive stipends from next week.